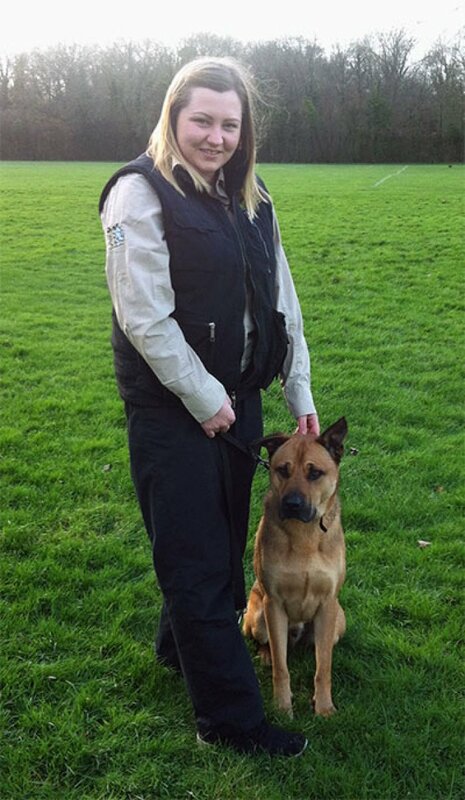 My name is Shauna of Bark Busters Home Dog Training Horsham. I am your local behaviour therapist and trainer. I grew up around my parents’ dogs, lively barky Jack Russell Terriers, and that put me on the road to love animals. I bought my horse and loved riding and looking after him. In my late teens I decided to follow a career with horses and went to college and graduated with my qualifications to enable me to look for work, once I’d paid off my fees! I found myself an owner of Oscar, a handsome Shar Pei, German Shepherd, Rottweiler mix. A chunky, cuddly boy who was a great companion walking and visiting my horse and snuggling at home, until one day he was attacked by another dog. That changed our lives completely. He became anxious, nervous and defensive of himself and me. He began to bark, lunge and tried to attack every dog that crossed his path. He barked at every noise he heard at home too and I was worried the neighbours might complain. Not only that, he started to react negatively to people too. One day, when charging to get to the postman, he careened straight through a glass door. I began to dread taking him for a walk as I was embarrassed at his behaviour, and being a strong dog, he was sometimes hard to hold back. I realised at that point that I needed some professional help and started to scour the internet for help. I found Bark Busters and a speedy appointment was made. The trainer, at that time, really opened my eyes to how dogs perceive the world and taught me how to understand Oscar’s body language. She taught him to focus on me whenever he felt unsure of situations. I had purchased one of the Support Guarantee services so once I’d paid, I had no worries about asking for additional help. After three lessons, there I was walking around the local area with other dogs in sight and Oscar had relaxed and listened to me. It was the beginning of getting my “old” dog back again! 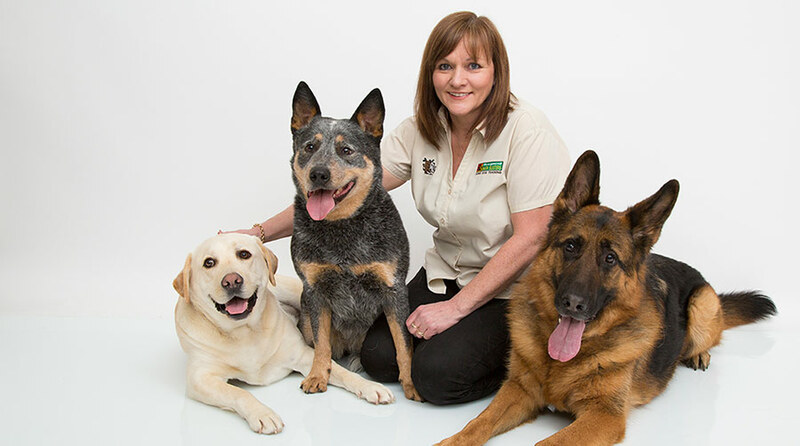 I was so impressed with the calm, gentle, communication techniques taught to me that I decided to change my career to becoming a Bark Buster behaviour therapist and trainer in Horsham. I applied and was accepted, thoroughly enjoyed my training and have never regretted my decision for a moment. Oscar now has a little sister. A young 18 months old, that I initially fostered for a friend because she was a nervous wreck, just due to her timid personality. She and Oscar are opposite in that respect, but they have complimented each other, he, helping my work in giving her more confidence, and she, teaching Oscar that it was fun to play! I love my work, helping and meeting people and their dogs in the Horsham area. Helping them to understand “why” their dog misbehaves and then tailor making a kind, calm communication training programme to follow, so they can achieve what I did. Most dog owners see a difference in their dog's behaviour during the very first lesson and the simple to follow techniques makes it easy for them to carry on and take the training to the level with which they are happy. In addition to the behavioural therapy work, I am a volunteer for a charity, assessing dogs and their owners as to their suitability to become visitors to hospitals, hospices and residential homes. I assess the suitability of their dog becoming a therapy dog helping everyone and enjoying the strokes and cuddles themselves. Together with that I have worked in schools, helping teachers to train their own puppies into being calm quiet therapy dogs in their school. Lying quietly whilst children read to them or simply enjoying gentle attention from the children, helping to create a calm environment for both mainstream and special educations classes. Contact me to see how I can help with your dog’s behaviour problems such as barking, boisterousness, aggression, separation anxiety and much more; or maybe you're looking for puppy education lessons? Whatever the behaviour problems, or training needs, I'm here to help. Together we can rebuild your relationship with your dog to be a rewarding one.